From the moment she interviewed for the soon-to-open UW School of Veterinary Medicine, Sheila McGuirk embraced her new community and its grand cow show at World Dairy Expo. 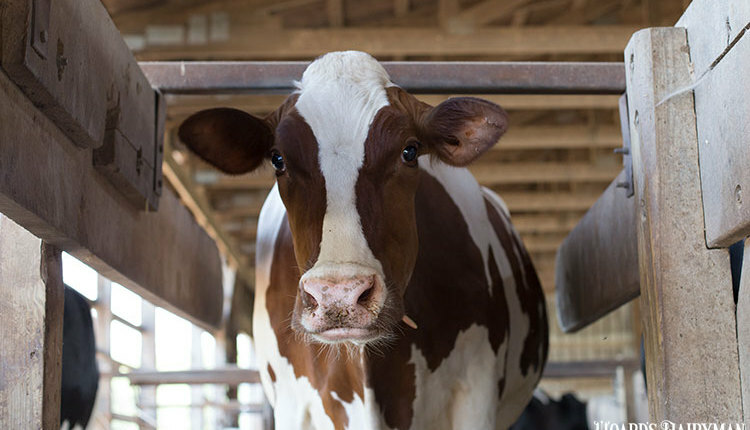 Throughout the process, she helped transform dairy cattle health care. Sheila McGuirk, D.V.M., called a 1982 interview for a founding position on the University of Wisconsin School of Veterinary Medicine faculty “a heaven-sent interview.” Upon accepting the position, McGuirk became a pioneering woman veterinarian, a highly regarded instructor, the “Mother Teresa” of cow care, and a leader in showring ethics. Above all, she deeply understood the hardworking nature of dairy farm men and women and their love for the cows. It’s this deep appreciation for both bovines and their caretakers that has allowed McGuirk to be a trendsetter in the dairy industry. In 1982, you interviewed for a position on the faculty at the newly created University of Wisconsin School of Veterinary Medicine prior to the building even being completed on campus. Talk about that October trip to Madison, Wis.
Sheila: I came on faith that there was going to be a veterinary school at the University of Wisconsin-Madison. I was drawn by Danny Butler, D.V.M., who was chair of the medical sciences department. He was charged with bringing the new veterinary school to fruition. Prior to that interview, I had completed an internship supervised by Butler at Ontario Veterinary College. When I came to Madison, there was a very small group of people who interviewed me. The bulk of my interviews were with staff from UW-Madison’s Department of Dairy Science. In fact, UW-Madison’s Department of Dairy Science is where I conducted my seminar to complete the formal interview process. On the second half of the first day of interviews, I was dropped off at World Dairy Expo to watch the show and to interact with professor Dave Dickson. I met with Neal Jorgensen and Terry Howard, too. All of them were just extraordinarily welcoming. What caused you to eventually become a founding faculty member at the University of Wisconsin School of Veterinary Medicine? Let’s take a step back. As an undergraduate at Cornell University, you were an accomplished athlete in both basketball and tennis. You also were a member of the Cornell Dairy Cattle Judging team that won the 51st Intercollegiate Dairy Cattle Judging Contest. How did dairy cattle judging shape your career? Sheila: It had a great affect on my career. 4-H dairy cattle judging taught me discipline, decision-making, and being able to defend my decisions with oral reasons. All of those skills were applicable to someone who wanted to be a veterinarian. 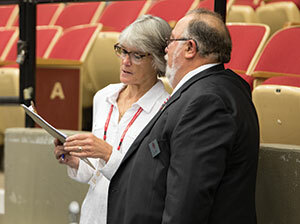 Sheila McGuirk, D.V.M., and Al Deming were teammates on the 1971 Cornell University judging team that won the 51st Intercollegiate Dairy Cattle Judging Contest. “Al is grounded, and he’s unflappable. All those traits I see in Al today were apparent when we were on the judging team,” said McGuirk. Then there’s the cow knowledge. Understanding functional traits, looking at “normal” cows day in and day out while on the judging team, all apply to being a good veterinarian. As I look back on my career, being able to evaluate cows as they walked had great value. To have that background as a veterinarian is extraordinarily beneficial. 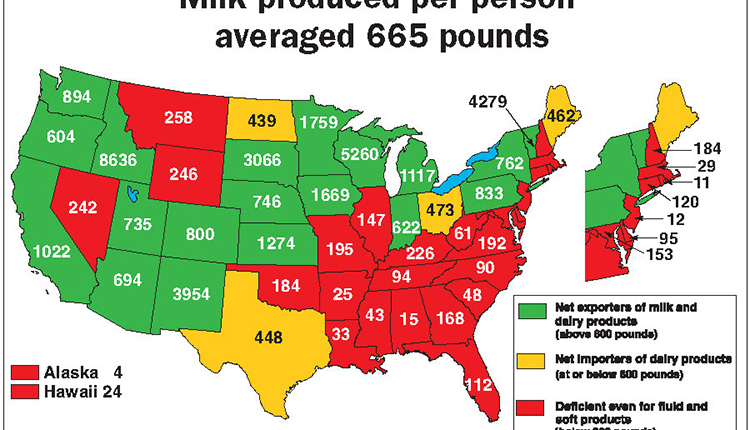 This definitely ties into World Dairy Expo. Al Deming was your teammate that year on the Cornell team. Eventually, Al became president of the board of directors at World Dairy Expo. What can you tell us about Al? Sheila: Three of the four members of the Cornell judging team from New York — Bill Thompson, Al Deming, and myself — all ended up in Wisconsin. It’s quite amazing how it all came back together. Al was extremely well-grounded and unflappable. As a person, Al is quietly confident, decisive, and articulate. When I hear Al speak at a board meeting, I can hear the Al from my college days. He also has a great sense of humor. Al is certainly a leader. You once were quoted as saying, “Of all the things that are expected of me as a professor, the thing I love most is to teach.” Why is that? Sheila: I love the interaction with people. My teaching stays enthusiastic and excited because it’s an opportunity to impart new knowledge. It’s an opportunity to give people power to make a difference. It’s an opportunity to make the world a better place, and that drives my enthusiasm for my profession and for what I do in life. You have been a volunteer at World Dairy Expo since 1983 and played a pivotal role in developing techniques to test milk for possible adulteration to eventually create World Dairy Expo’s ethics standards. Talk about that pioneering process. Sheila: That interest was stimulated by Terry Howard, who served as the second overall Dairy Cattle Superintendent at World Dairy Expo. 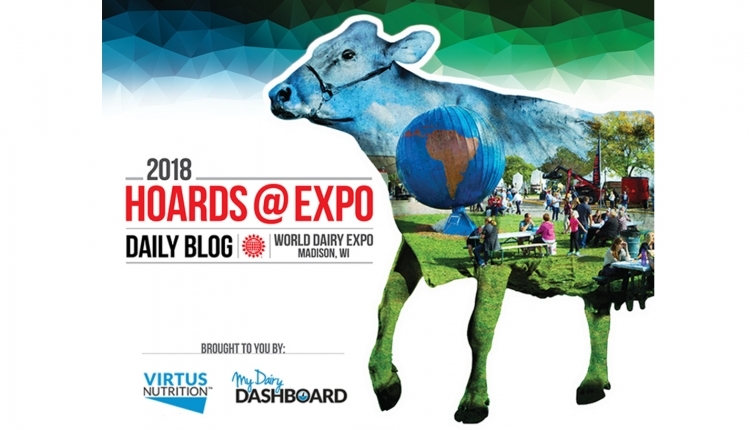 Terry wanted World Dairy Expo to be a show that stood above others employing practices in the showring that were defensible and did no harm to animals. Terry Howard wanted cows to win on their merits and not the things that were done to alter their appearance. I’d really never fitted cattle or done anything of that nature. But, I had the help of a few people, Jim Armbruster and Jenks Britt among them. Particularly, I was focused on any type of enhancements done to cows that were bad for the cow. I definitely wanted to make sure I was part of helping us know how to evaluate that situation. We tried employing some techniques used in the showring to smooth out udder attachments. 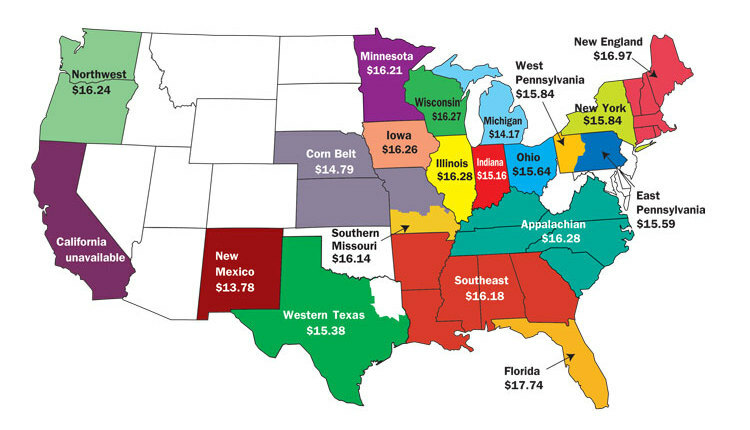 We looked at what people might fill a quarter with, and we studied those effects. Of course, the science has grown, and now we have several analytical techniques for milk inspection. There are probably still things we don’t know about milk sampling that we need to know, but we move forward in bits and pieces. Ultrasound has been a great tool for the profession and for shows. That has really put objective criteria behind many of the things that we did early on, which had been fairly subjective up until that point. Prior to that, other tools we used like palpation, appearance, and comparing one mouth of a heifer to another mouth of a heifer all took intuition. We wanted to work toward being as objective as possible. 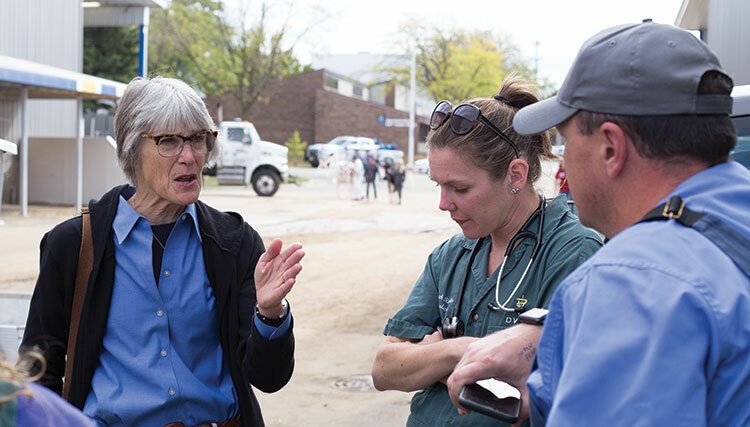 Working in 8-hour shifts, Sheila McGuirk, D.V.M., leads dairy cattle check-in and health certificate inspection at World Dairy Expo with students from the University of Wisconsin School of Veterinary Medicine. You didn’t stop there, as you were pivotal in streamlining the cattle check-in process at the show, even getting veterinary students to assist with check-in of the estimated 2,700 animals each year. What makes that process function so well? Why has it been a valuable experience for veterinary students? Sheila: When we started that, then General Manager Mark Clarke and then overall Dairy Cattle Superintendent Bob Kaiser came to me and said we needed to be far more proactive on biosecurity and the check-in process. Prior to that, cattle were commingling for a day or two prior to check-in. Health papers were looked at but not necessarily with the cow in its presence. We decided it was necessary and timely to get that process done on the front end for the safety of all. I thought to myself that looking at health certificates, looking at cattle together, and watching them come off the truck would be potentially a great experience for veterinary students’ awareness of the importance of certificates of health inspection done by veterinarians. Again, the importance of seeing these incredible cattle, seeing what Madison had to offer in terms of World Dairy Expo, would be valuable to these students as it was for me as a young person. I was astounded to have volunteers. And I didn’t restrict it to veterinary students. I got some undergraduates, and I got some people who worked in the veterinary school. We gave them an introductory lecture about World Dairy Expo, official cattle identification procedures, and biosecurity. The reputation of the course keeps the students coming back and enrolling again. So, I’m going to ride this horse until we have a catastrophe. 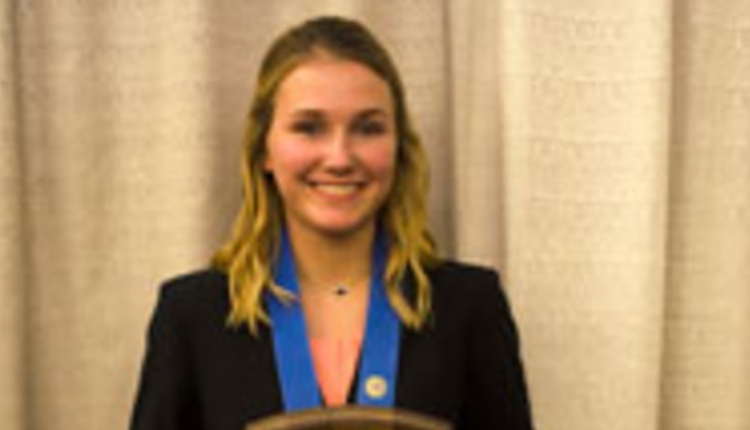 I think it unquestionably has been a win-win for the students, for me, for the exhibitors who interact with the students, and, of course, World Dairy Expo. The exhibitors understand now that some of these students come from large cities and have never seen cattle face-to-face because it is their first year in veterinary school, and the exhibitors have the opportunity to change the lives of those students. These are students who, when they get to their third year and they want an elective, may not dodge the cattle electives because they remember a positive experience with exhibitors from World Dairy Expo. These days, you are leading the effort to document concerns about overbagging cows. Why is that important? Over the years, as these cows are producing more and more milk, you think, “Just how full can those udders get?” You observe cows ringside and you see a little more edema in the rear crease, you see them walking a little bit wider behind, and you wonder: Have we reached a point where there is too much emphasis on udder fullness? Are the cows getting uncomfortable? Are they in pain? It’s a situation that I’ve been watching through the years. Now with the help of ultrasound, we can also see the build up of some edema inside the mammary gland. Some researchers have shown that, at least temporarily, when cows have not been milked for 24 hours, they’ll have a little bit higher somatic cell count. Is there additional harm? Are we overdoing it? Are the people who want to see these cows perform comfortably, at their best, stepping over the line? Many of us have agreed to look deeper into these issues.